Staying stocked up on underwear, undershirts and socks has never been easier. From staying fresh at the office to keeping cool at the gym—we have you covered with Extras. The following guide will let you know how to get started. Deciding on the Extras you need depends on a few factors. Are you wearing them on a typical day at the office or to the gym? What is the temperature outside? How many should I get? You’re about to find out. From boxers to briefs, we have the styles that best suit you. With options enhanced for comfort and performance, you’ll never go back to the kind that comes in packs of twenty again. You should have (at least) one pair for every day of the week, plus a few more for laundry day. Get an additional pair for every day you go to the gym. Get the right pair for the job—choose comfort for normal days and performance fabrics for exercise. 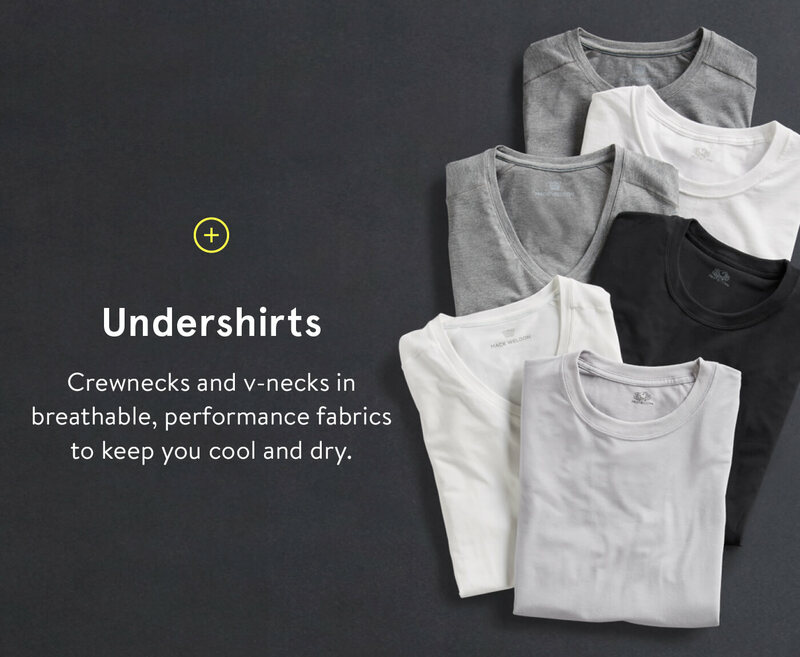 Crewnecks and v-necks in breathable, performance fabrics keep you cool and dry. We carefully select styles to help regulate temperature and keep their shape. Innovative fabrics help make this essential wearable from morning to night. A good undershirt can also help flatter your silhouette when you wear a tucked-in shirt over it. Wearing undershirts will protect your button-ups from sweat and yellowing from deodorant. Footwear doesn’t stop at shoes, so stock up on the socks. You know you’ll need them. Having a mix of tall and low-cut pairs will ensure that you’re always ready. Get more than you think you need—they have a way of disappearing. Fabric width matters—thin socks are best for hot weather or exercise and thick socks for cold weather. 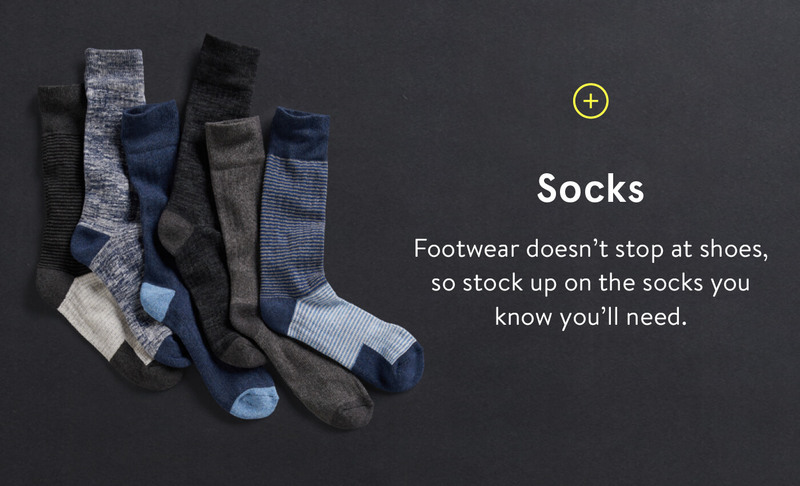 The right socks will help keep your footwear odor-free longer—we can all use that. Ready to upgrade your basics? Get Extras that work as hard as you do.